June 5, 2012 / P.J. Four-year-old Ethan gets some help from his father, Joe, Sunday at a local event. Sometimes, it’s not the most simple of tasks to get an area interested in disc golf. 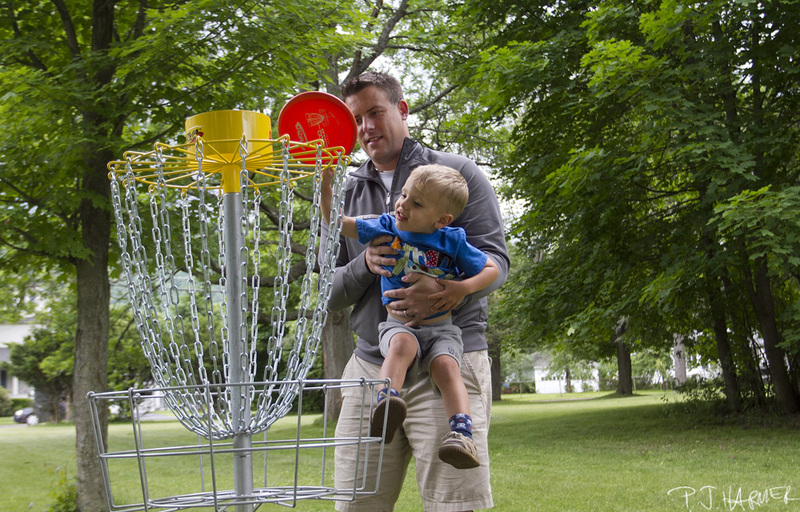 For more than two years, a few people — spearheaded by one person — have been trying to get a disc golf course at a local park. Though originally accepted with open arms, it’s recently battled red tape and silly “roadblocks” in the quest to get the course in the ground. 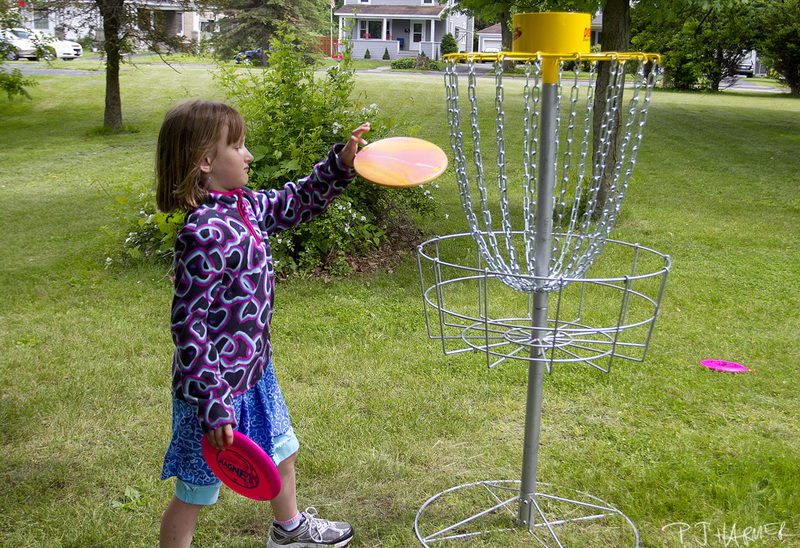 Six-year-old Rylie sends a disc into the basket. The worst part of it is that we’ve already raised a whole heap of money. Alas, until the red tape can be cut, we’re stuck. The area is ripe for this game, too. There are a lot of younger athletes who have shown interest in the game. And once a few of them got involved, we have no doubt it would continue to grow. Especially with having a good course at a nice park. Even if it had to start out as a 9-hole course with a couple of tee pads on each hole, it would be good. In the hopes of spreading the word in our area, we — as a site and as a small group of people — got involved with a local event held by the Oneonta World of Learning. The idea was to set up a small temp course and allow people to try disc golf and see what it was all about. Unfortunately, Mother Nature rained on our parade. Or at least threatened. With thunderstorms in the forecast, the event was moved from a local park to the area Boys and Girls Club. Originally, we were going to be in one of the gyms. Instead, we went outside to a side lawn and set up a small three-hole course. We had signs inside saying we were outside and the DJ announced things we were doing. It didn’t go as well as we hoped. 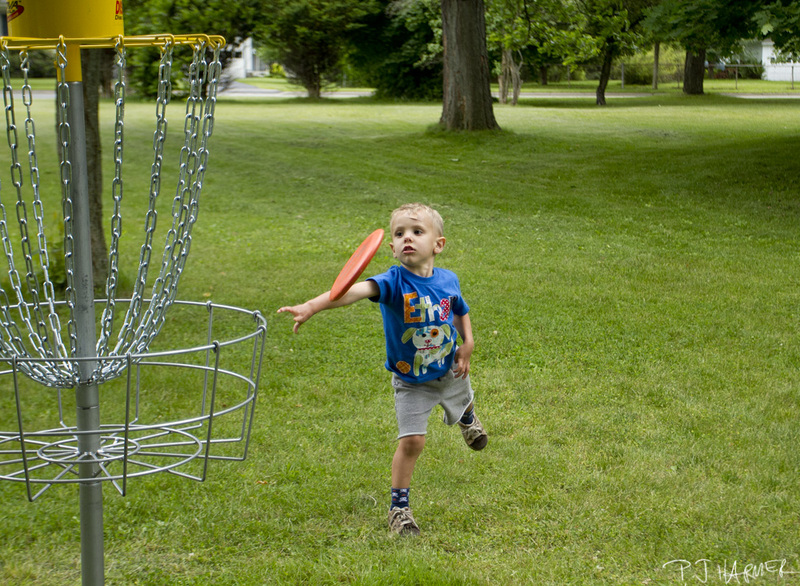 Four-year-old Ethan looks to put the disc into the basket. Despite hundreds of people attending the event, only a handful seemed to come out and check things out. We tried to fish a few people in as they walked by from the parking lot, but we got the “maybe on the way back” type of response. They were there for the free ice cream. Alas, the people we did get to come check things out seemed interested. Some younger kids and families enjoyed it. They were interested in knowing attempts were being made to bring a course to the town. A few high school-age kids also tried it out and seemed to enjoy it. In the end, if we got a few families and teens interested, then it was well worth it. Any way to build the game is a good thing. For the record, we went par-3 on each hole, so it was a par-9 course. The first time around, Dave scored an 8 for the course record. I followed with a 7. Chuck did the same in the next round. Our co-record stood. I may never get a course record again, so I’ll take it! Hopefully, we’ll have the chance to do this again and draw more people. These are the little things that I believe will help continue to grow the sport. We can hope, anyway. ← Poll 13: What would be worth paying for? That sounds like a solid effort for a great event, keep up the solid work in spreading the game. Great story! Way to help build the sport – the locals don’t know just how lucky they are! Kudos to you all for all of your efforts, looks like the kids had a great time! Love the photos! Not to worry, P.J. – It’s a great sport and growth takes time. The game is coming around more and more. I practice flying my LED discs at dusk at our local park and get a lot of looks and inquiries. The word is getting out, and the demand will follow. I couldn’t agree with you more. I’m an avid disc golfer from st Louis and started about 8 years ago. I remember in the beginning I would get “looks” from obviously more advanced disc golfers that was somewhat discouraging…. Being lucky, my father owned enough land to build a private course with me. Ive turned my 5-10 over par to usually around par to 5 under on just about any st Louis course…. Point being I may have given up the game due to ignorant looks at parks… I see these same guys around now and I clean their clocks… Don’t give up, it may take time but it’s all worth it for a great game! !